With lead heavy guitars and powerfull pace from the rythm section does Lillian Axe's new vocalist Brian Jones guide us into LA's eleventh release 'XI - The Days Before Tomorrow'. Steve Blaze on guitars and keyboard is the songwriter and driving force in the band and he give us over 50 minutes of mature american hard rock. Stunningly guitar bursts and great melodies which grows and gets richer for each spin. Steve build the songs with a great guitar base and gives the singer plenty of space to deliver the lyrics in the songs. In Brian Jones they really got a high fueled vocalist that hopefully stays in the band for more that this album. 'Axe' plays in the same division as Warrant, Dokken and such American styled bands. 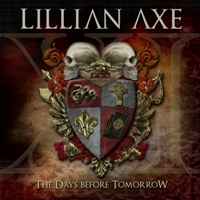 Lillian Axe is a much underrated band and I've had a hard time to make up the rating for 'The Days Before Tomorrow' because this is a album with both individual technical qualities, nice melodies and a production in world class, but still it doesn't grab me...it somehow feels a little deadpan in some of the tracks. But overall is this brilliant musical entertainment for fans of guitar ekvillibrism and solid hard rock with a metal sting in the tunes.